ADK is hosting the 2018 Young Lotus Workshop at AdFest in Thailand. This two and a half day workshop is a popular feature of the annual creative festival. Young teams get a chance to learn from eight top professionals as mentors and then the opportunity to compete on a brief, with just 24 hours to meet the deadline. 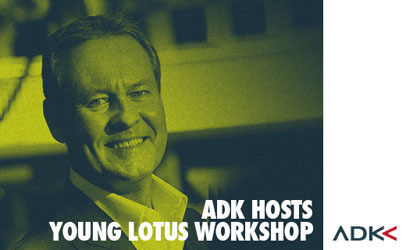 Rob Sherlock, Chief Executive Officer of ADK Global is the Chairman of the Young Lotus Workshop. Sherlock is a well known figure in the ad business having worked on five continents and for agencies such as FCB, Draft and JWT. He is currently based in Singapore.